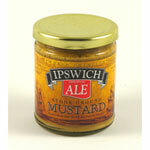 This special mustard starts with whole mustard seeds that have been marinated in Bar Harbor Real Ale blended with brown sugar and spices to create an exotic spirited mustard. 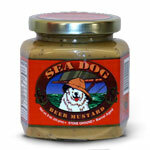 This taste sensation made Raye�s Bar Harbor Real Ale Mustard an Award Winner in the Beer Category. The ale is brewed by the Atlantic Brewing Company in Bar Harbor, Maine. Ingredients: Raye's Bar Harbor Real Ale Mustard ingredients: deep well water, blended whole mustard seeds, whole mustard seeds marinated in Bar Harbor Real Ale, distilled vinegar, brown sugar, barley malt, caramel, salt, true spices, and chili. Raye�s all-natural stone-ground mustard is small batch crafted, high in antioxidants, gluten-free, low sodium and has no GMOs. 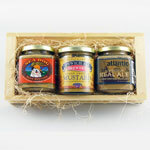 Raye�s Mustard Mill, located in the coastal city of Eastport, Maine, the nation�s eastern-most city, is last remaining traditional stone-ground mustard mill in North America. Raye�s takes great pride every day in producing a fine quality product that delivers not only a memorable flavor experience, but real benefits for today�s healthy lifestyles. No cholesterol, no fats, no eggs, no additives, reduced sodium, low carbohydrates.